Found one file extension association related to Network Supervisor and 1 file format developed specifically for use with Network Supervisor. 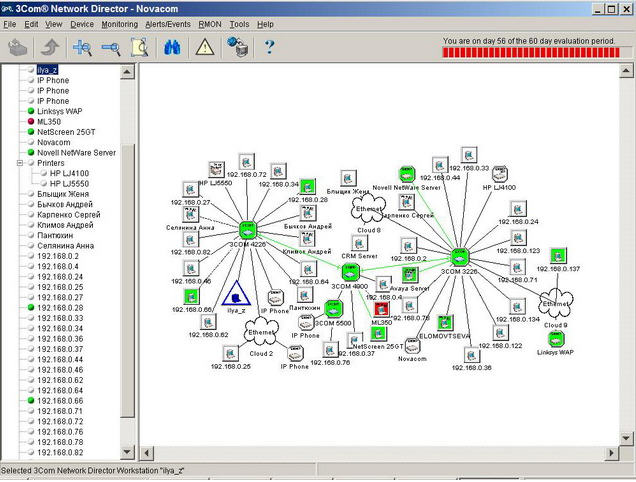 3Com Network Supervisor is an easy-to-use management application that graphically discovers, maps, and displays network links and IP devices, including 3Com NBX telephones and some popular third-party products. It maps devices and connections so you can easily monitor stress levels, set thresholds and alerts, view network events, generate reports in user-defined formats, and launch device configuration tools. What's more, when your network changes, you can prompt 3Com Network Supervisor to regenerate the appropriate part of the map to ensure that you have current information. Automated operations, intelligent defaults, and the ability to detect network misconfigurations and offer optimization suggestions make this application ideal for network managers with all levels of experience. 3Com was acquired by Hewlett-Packard. The Network Supervisor software seems to be old or discontinued. If you need more information please contact the developers of Network Supervisor (3Com), or check out their product website.